Using a simple Google Spreadsheet template and Flippity.net you or your students can easily create digital flashcards. The flashcards can then be shared out with anyone, making them a valuable independent or communal study tool. In addition to text, you can include pictures or video. Go to Flippity.net and make a copy of the template provided in Step 1. 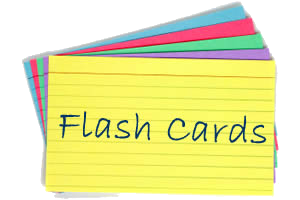 Edit the flashcard template by editing and adding each side of the "flashcard." Go to File > "Publish to the Web…", then click Publish. Click on the "Get the Link Here" tab of the spreadsheet template (at the bottom). Paste the link in the light green cell (A3) to get the link to your Flippity Flashcards. Click on the Flippity.net link to view your Flippity flashcards. From here you can bookmark the page and/or share the link with anyone you want to view your flashcards.